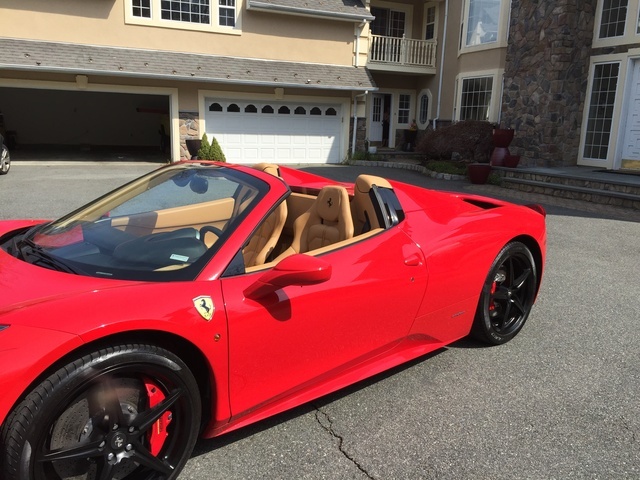 Looking for a Used 458 Italia in your area? CarGurus has 221 nationwide 458 Italia listings starting at $144,895. Do you want to see your engine or hear it? That’s the choice Ferrari offers with its 2012 458 Italia, now available in Coupe and Spyder flavors. But why the hard choice, you ask? Well, in the Coupe, you’ll get to look through the transparent engine cover at that glorious 4.5-liter, all-alloy V8. Not so in the Spyder, as that "first folding hardtop in a midengine supercar" had to go somewhere. Ferrari was eager to make up for the loss, however, and the exhaust in the Spyder has been tuned to sound even better with the top down. It makes use of the active exhaust system in the Italia, which was adopted to meet European noise standards in town. Below 4,000 rpm, it’s a muted version of the fury contained within. Above that line, unleash hell at will. The 458 Italia will have 562 horses of hell to be precise, and 398 lb-ft of torque as a foundation before you hit that 9,000-rpm redline. It’s all you could ever want from a dry-sump, 90-degree V8 shoved firmly into the middle of an Italian supercar, and we haven’t even gotten into the records it sets. That 9,000-rpm redline? Ferrari is claiming it’s a road-car first. Same with the power ratio, which set a world record for most power per liter in a naturally aspirated production engine. And don’t forget the 12.5:1 compression ratio, which demands mention, record-setting or not. With the 7-speed dual-clutch transmission as the only option, the 458 is the first mainstream Ferrari model to arrive without a traditional manual. Still, it’ll scoot to 60 in 3.4 seconds and touch 200 before it’s done. Though the engine remains the same regardless of your choice of top, there are some differences between the Italia Coupe and the Spyder, which drops the "Italia" in its press materials. Ferrari is betting the typical Italia driver is a serious species, looking for an occasional foray onto the track, whereas the Spyder owner is more relaxed, choosing leisurely loafs through mountain roads as opposed to attacking every apex in sight. In that spirit, the suspension of the Spyder was softened and the traction control reined in compared to the Coupe, reflective of the laid-back attitude so representative of most 200-mph Italian supercars. And of course there’s the excess weight and the rigidity deficiency. Thankfully neither are too obtrusive, at 110 extra pounds and some mirror shudder when pushed. But don’t think you can solve that by pushing the button and waiting the 14 seconds for the top to erect itself—it’s not a structural member. No benefits for losing the sky, but a slight penalty for having the option. But then, anyone who’s driven a convertible knows there’s extra speed available in a drop-top that cannot be measured by any dyno or speed gun, and isn’t that what’s most important? Besides, the Spyder looks better than the Coupe, top up or down, and anyone who says aesthetics aren’t important in a supercar isn’t shopping for a Ferrari. But if you want to hit the track, the Coupe is the only option here. Crank the manettino over to Race mode and feel everything screw down tight. Wind it out hard and trust the carbon-ceramic brakes will bring things to a halt with authority, thanks to 15.7-inch front discs bitten by 6-piston calipers. Nevermind the 14.2-inch rears that have to make due with 4-piston calipers—a setup that would make most sports cars jealous, front or back. However there’s more than just the lack of a manual transmission to make Ferrari faithful flinch. The ergonomics inside are wonky, with controls shuffled around to make room for the paddle shifters flanking the steering wheel. This means no traditional stalks and too many buttons on the steering wheel. Couple this with the floating dash that just doesn’t belong in a Ferrari and things can get disappointing fast. But from the outside, it’s hard to argue the strengths of the Italia, Coupe or Spyder. And when that engine cranks and begins spitting fire behind you, I’m guessing ergonomic irks will rapidly fade in the distance. What's your take on the 2012 Ferrari 458 Italia? Have you driven a 2012 Ferrari 458 Italia? Can a private seller, a non-dealership, list a car for sale on cargurus?